Our Society aims to perpetuate the memory of our Pilgrim fathers, and cherishes and maintains the ideals and institutions of American freedom. For complete information on our mission see our Objectives. We also promote the education of our Mayflower heritage with our Pilgrim in the Schools program, and our scholarships. The Society hosts two major luncheon events each year for members and their guests in Indianapolis at the Woodstock Club. Each luncheon includes a historical program informing members about the history of the Mayflower and early life in the new settlement. Information about upcoming luncheons are featured in the Indiana society's newsletter which is published twice a year. 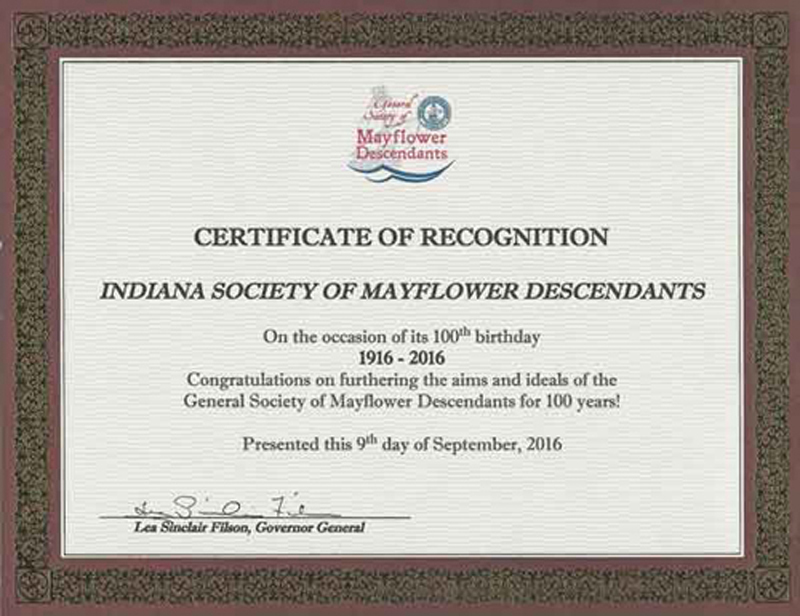 The Indiana Society of Mayflower Descendants was proud to host the GBOA Meeting in Indianapolis September 8-11, 2016. A Certificate of Recognition was awarded by the General Society on the occasion of Indiana’s 100-year Anniversary Celebration.